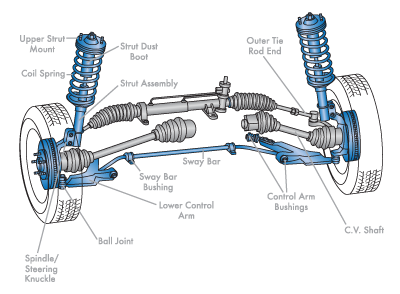 Almost every different vehicle manufacturer today has multiple different suspension and steering designs. Each one precisely calibrated and set up. Knowledge of every type of system as well as how to diagnose problems is a must when working with them. Our technicians hold certification from the National Institute for Automotive Service Excellence (A.S.E.) in A4 Suspension and Steering and have an advanced knowledge in the diagnosis and repair of these systems.